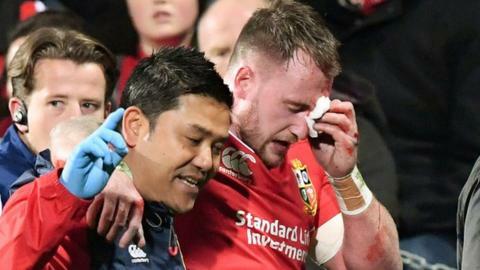 Jonathan Davies and Stuart Hogg were ruled out of the British and Irish Lions' game against Highlanders on Tuesday after both suffered head injuries in a 12-3 win over Crusaders. Welsh centre Davies was hurt as a try-scoring chance went begging and was taken off soon after. Hogg was cut over his left eye after accidentally colliding with the elbow of Lions scrum-half Conor Murray. Davies and Scottish full-back Hogg both failed head injury assessments (HIAs). They are not allowed to play for a minimum of six days and will have to pass the return to play protocol before being made available for selection again. Fly-half Dan Biggar failed an HIA after the 22-16 defeat against Blues on Wednesday, 7 June. Tour captain Sam Warburton returns against Highlanders after injuring his ankle in the opening match of the New Zealand tour against Provincial Barbarians on 3 June. However, Warburton's fellow Welsh back-rower Ross Moriarty remains absent because of a back problem following their win over Provincial Barbarians. The fixture against Highlanders in Dunedin (kick off 08:35 BST) is the Lions' fourth of the tour with matches against Maori All Blacks and Chiefs to follow before the first of three Tests against New Zealand on Saturday, 24 June. What is a head injury assessment? 1. Player must correctly answer a series of simple questions including: What venue are we at? Which half is it?